When Margo invited me to her blog, I decided to post about something we both love: handbags. I adore handbags and have acquired many over the years. I have vintage, handmade, and designer ones. But mostly, I look at vintage. For a while, the designers were churning out the same ol’ style: large garbage bag. That was so not buttoned-up, nice, value-conscious me. And I would much rather buy a whole passel of bags for $100 than one. Of course, it depends on the bag. So Margo and I came up with three categories: Best Bargain; Most Over-the-Top; and Least Practical. Today, I’m featuring the Best Bargain. 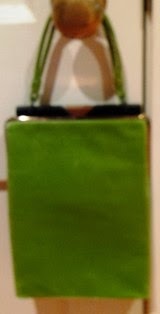 Best Bargain: This is a lovely rectangular, green kid leather bag, definitely vintage, and I can’t read the manufacturer. The handle is short which I like as shoulder bag handles fall off my shoulders. The catch is plastic with a fun gold latch. Surprisingly, it does hold many items. But I bet you are wondering how is this a best bargain? I paid $3.00 for it at a flea market. Go me! I’ve purchased many a vintage bag and some have never been carried. Surprising—right? So that makes them brand new in my book. But if it had been carried, wouldn’t it be lovely to think of that bag belonging to someone special who had been given it by someone special or picked out for a special occasion. Hattie Cook’s dream job is down the toilet and her new SUV violated. Desperate for cash to cover the basic necessities of rent and food, she takes a temporary job at Buy-Rite insurance company where she uncovers an embezzling scam tied to the death of a former employee—the very one she replaced. The last thing she wants is to clash with By-the-Book Detective Wellborn, no matter how much he makes her heart pound.Allan Charles Wellborn has secretly adored Hattie all his life. He evolved from a pocket protector-wearing geek to a handsome police detective. When the police determine there’s more to the death of a former Buy Rite employee, he steps in to lead the investigation. Overly dedicated, always perfect, he puts his job first, even if doing so ultimately hurts the one he loves. Preorder now! Temporarily Employed New job. New love. And murder. Hi, Margo! It’s great to be here and share my love for all things handbags. Hugs!